Beth Lilly on left; Lisa Sutcliffe on right. Photographs on the wall are by Jill Frank. 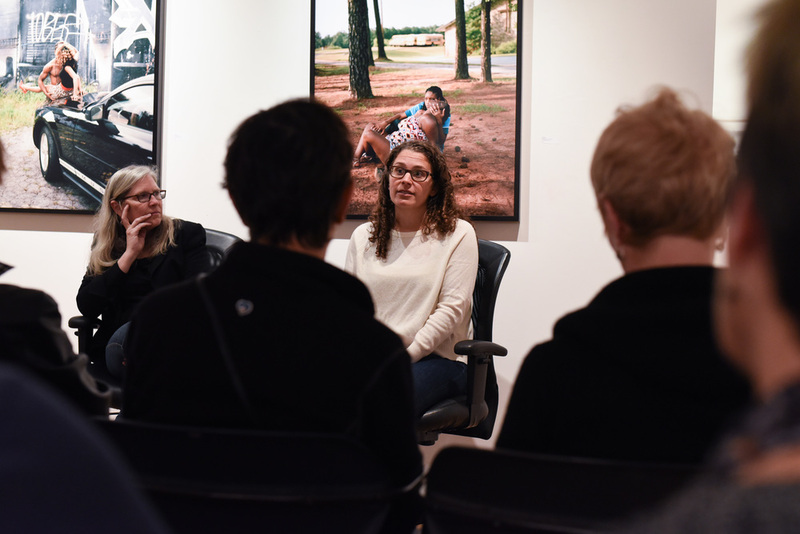 Lisa Sutcliffe, Curator of The Milwaukee Art Museum, selected a photographic series from 7 artists to be displayed in the Atlanta Photography Group Gallery. Today, she talked about how she made her selections. Lisa said that she is attracted to photographs that are "idea driven" and ask questions rather than answer them. She is also very interested in the way we use the medium of photography and how it is evolving. Let's start with my favorite series, which was by Jill Frank. Her photographs feature people who have posed themselves for what looks like a different photographer off-camera. In some cases, they actually were posing for another photographer, and Jill crashed the photo session. Other photos were arranged by Jill, but she took the photographs from a side angle, which makes it look like the subjects were unaware of her presence. These photos are a part of an ongoing series in which she is investigating how we pose ourselves for pictures and present ourselves to the camera. Nancy Floyd has an interesting display of "slow selfies". She has been taking one photo of herself everyday for 20 years. She photographs herself using film and only develops them every few years. This is the opposite of our immediate, digital culture. The most abstract pieces were by Christine Price Washington, who literally put a piece of photographic paper in her bag everyday and allowed it to "develop" in her bag. Lisa Sutcliffe mentioned that this was a sort of diary of her day but very different from Nancy's selfies (above). Christine's work asks the question - "What is a photograph?" Other works in the show are by Stephen Milner, Sarah Christianson, and Zhao Qian. It's worth a trip to see the show, but it did prompt me to ask - "What elements give a photograph the ability to stand on it's own (without the artist statement or story)? What makes a photograph interesting?"